Can spa services offer benefits for Raynaud’s Disease? Some people experience periods of time when their fingers or toes turn color to white or blue and go numb. This phenomenon is called Raynaud’s disease and it is fairly common, affecting 5-10% of the population. 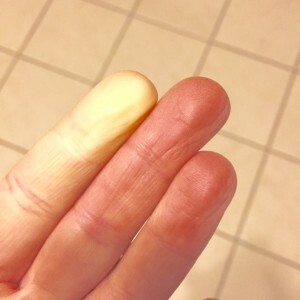 Raynaud’s disease is a condition characterized by periods of time when the fingers or toes (sometimes nose and ears) turn color and go numb due to an interruption of blood flow to the extremities due to a vasospasm (Mayo Clinic). Often they will turn white, sometimes blue, and then red when blood flow returns. Typically people with Reynaud’s feel numbness in the affected areas during an episode and may experience pain when blood flow returns. The most common cause of a flare up is exposure to cold, though sometimes people experience the phenomenon during times of stress. Raynaud’s may be primary (meaning it isn’t due to an underlying cause) or secondary (the phenomenon is due to a condition such as nerve damage, carpal tunnel syndrome, rheumatoid arthritis or lupus.). According to Mayo Clinic, some medications can also cause the Raynaud’s phenomenon. The majority of people who experience Raynaud’s symptoms do not report it to a physician, (Raynauds.org) but it is worth noting at your next medical visit as occasionally Raynaud’s disease presents before a more serious disorder. Nails may turn blue during an episode and over time, nails might develop ridges related to Raynaud’s. Can spa treatments help with Raynaud’s disease? While I could not find research on spa services and Raynaud’s disease, some services may help with some of the causes and help to reduce some of the symptoms. Deep tissue or orthopedic massage may be able to help people with wrist, arm, and hand injuries (like carpal tunnel) that may be contributing to the Raynaud’s phenomenon. Hot stone massages will likely feel great and boost circulation for individuals who are perpetually cold, but aren’t going to “cure” Raynaud’s phenomenon. If you notice an increase in Raynaud’s phenomenon at times of emotional stress, you might consider regular massage or spa services you enjoy that have been shown to lower stress. If you are self conscious about the way your nails look as a result of Raynaud’s disease (sometimes nails can become “spooned” or develop ridges) a professional manicure and application of a shimmer or glitter polish can help to disguise any nail disfiguration due to the Raynaud’s. Products like Kneipp mineral baths are great to purchase for an at-home spa experience to warm up during a flare-up. I personally use the Kneipp mineral baths after every cooler-weather run to relax my muscles and bring blood flow back to my hands and feet. Can spa services trigger Raynaud’s phenomenon? Ask for an extra blanket on hand in the room. Cut the toes off of a pair of old socks and bring them to put on before your nail technician polishes your nails. While your toes will be exposed, at least your feet will be warmer while your polish dries. You can cut the finger tips off of an inexpensive pair of “one-size-fits-all” stretch gloves for a winter manicure. After a service like a body wrap or hot stone massage, make sure to have plenty of warm clothes and gloves (especially in winter) or grab a cup of hot tea to hold after your service so you aren’t shocked by a temperature change. If you are one of many of us who experience discomfort from Raynaud’s, don’t be afraid to speak up when getting a massage, skin care, or nail care service! Your provider will be happy to make adjustments because he or she wants to make sure you can get full enjoyment and benefit from their work without worrying about your fingers and toes going numb! Don’t get me wrong, we LOVE CND’s Shellac nail polish (the Original Gel-Hybrid Power Polish), but we don’t guarantee it to be chip-free in every situation. Problem 1. You’ve spent a lot of time in water. 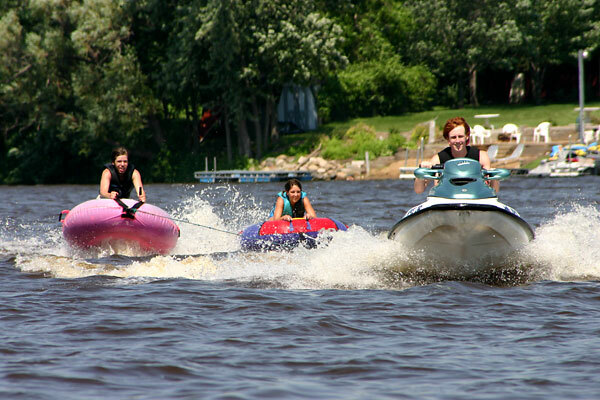 (The inspiration for this post was my weekend trip to swim in Wisconsin’s gorgeous, but skin-drying lakes…between the water and piles of alcohol-based hand sanitizer, my Shellac chipped on one very dry nail). 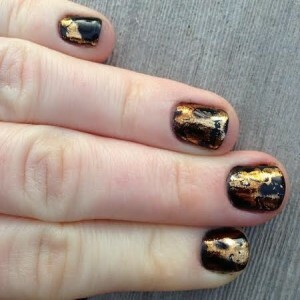 Water will cause your nail plate to expand and contract which gives more opportunities for the polish to lift. Spending time in chlorine-y pools, ocean water (yay, vacation!) or soapy water (lots of hand-washing) can also really dry out nails and polish leading to chipping and lifting and there isn’t much your nail tech can do about that. Solution: Keep CND solar oil handy and apply regularly. I know, it isn’t fun to think about cuticle oil on vacation, and it is a pain to think about re-applying it regularly if you have a job that requires frequent hand washing, but it is really the best way to try to keep all that time in water from causing your Shellac to chip or pop off. Also, using rubber gloves if you happen to have to be washing dishes or kids toys soapy water for an extended period of time helps! Problem 2. 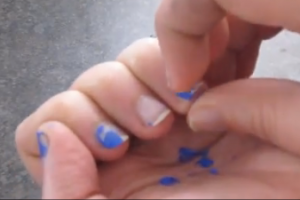 Picking off your polish. If you pick off your polish, it will cause nails to peel (delamination). When your nail tech re-applies your Shellac, it is likely to peel because the nail underneath is peeling. Solution: Keep a Shellac removal kit handy, we sell them, you’ll get several uses out of them, and knowing you have a removal kit at home can save you from mindlessly picking off your Shellac while waiting for your next appointment. If the damage has already been done and you’ve got peeling nails, try a treatment like CND’s Rescue RX for a week or two on “naked” nails before going back to Shellac to give your nail tech a healthier canvas to work with. You can also just go to a polish like CND Vinylux which wears well (but not nearly as long as Shellac), removes easily (not a fun one to pick) and doesn’t require the extra time or up-charge that Shellac does. 3. Using your nails as tools. If you use your nails to scrape or peel at things, you are likely to experience chips at the tip of your nails, even with the best polish application. Solution: Knock it off! ha ha, ok, I’m so guilty of this so I can’t really talk, but if you use your nails to pick at labels or tear open boxes, keep goo gone and box cutters handy so you have fewer excuses. 4. You have super short nails: Shellac still is great for short nails (we have so many massage therapists on the team so our nail techs are used to working with our little nail nubbins) but they can’t really “cap the free edge” of the nail as well as with nails that extend beyond your fingertip. This is a polishing technique that helps Shellac stand up to wear, tear, and shrinking better. 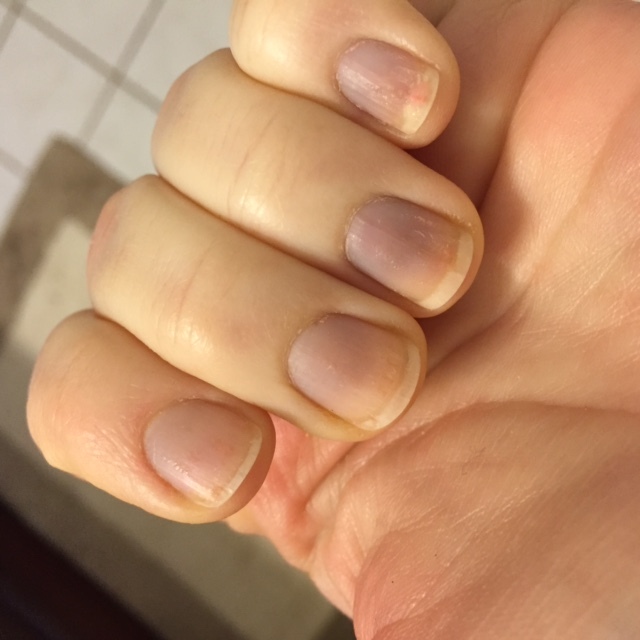 Solution: If you are trying to grow your nails, Shellac can be a good tool because it is a harder polish so makes them less prone to breaking and less fun to nibble if you’re a nail biter. 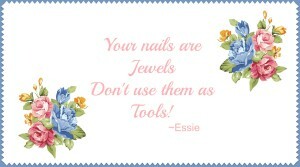 Can’t grow nails because of your job or lifestyle? No worries, you are less likely to use your nails as tools (See #3) so you might still get some great wear out of your Shellac. Plus because the polish is thicker than regular polish, you might get away with a bit more length than normal because it blunts the edge of your nail a bit. You can also go with a more neutral color so it isn’t obvious if it pulls from the tip a bit. Need expert help? 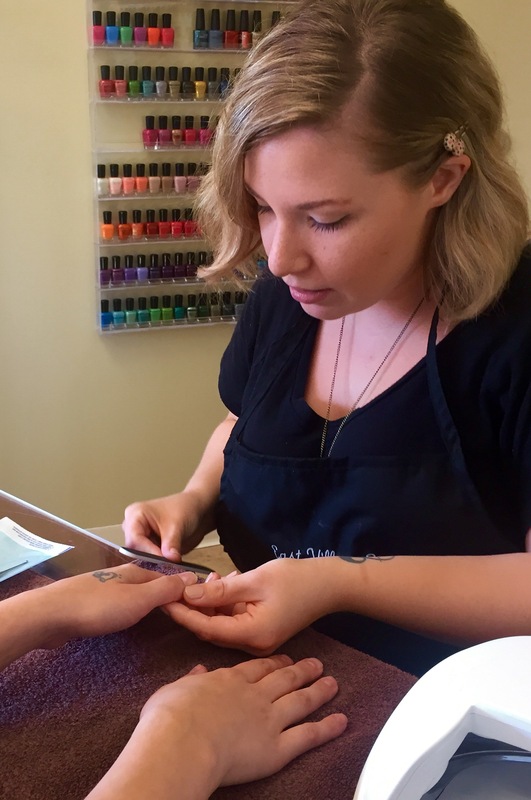 Book a manicure with one of our awesome nail techs! They are great at advising you on the best polish or treatment, helping your nails to look great at the length they are, or helping you to grow them if that’s your goal! I will admit, I stopped biting my nails years ago, but excitement over the spa expansion has wreaked havoc on my cuticles which are somehow finding their way to my teeth. Camille had her work cut out for her today, but my nails look and feel amazing so I won’t subject any massage clients to my rough skin! She asked if I was using my CND Solar Oil (I feel like she busted me…it was obvious I had not been!) and then suggested I use the Farmhouse Fresh Honey Heel Glaze on my hands to dissolve the dry, dead skin around my nails. It works on the thickest, toughest heel callouses, why WOULDN’T it work on my hands! My hands after a REALLY good manicure from Camille. I’ll be testing out Honey Heel Glaze as an intense cuticle treatment! I’ll give it a try this week and report back! If you have caught yourself biting your nails or cuticles, or trying to deal with the dry weather as the seasons change, book yourself a manicure at East Village Spa! Camille, Cassandra, Cammie, Katie, Sheena, and Lydia are all happy to help!